A soffit is the visible surface found underneath an overhanging structure such as an arch, staircase, balcony, cornice or beam, but it is commonly associated with ceilings. Ceiling soffit painting, either separately or along with ceiling spraying, can improve any commercial interior and is an easy process if carried out by professionals. The word ‘soffit’ stems from the French word ‘soffite’ meaning to fasten underneath, originally from the Latin and they can be found in an exterior or interior setting. The term soffit generally refers to the area that bridges the space between the top of an exterior wall and the edge of the roof (known as the eaves). It is normally attached to the lookout rafters (also known as lookouts). In commercial interiors, a soffit is basically a section of a ceiling that has been constructed on a lower level than the surrounding ceiling. They can be found in a huge variety of commercial properties including warehouses, offices, the healthcare, educational and leisure sectors as well as many different types of retail outlets. This architectural feature can be structural or simply decorative. For aesthetic reasons, a soffit may conceal a structural beam. They may also hide vents, pipes, HVAC ducts, fire sprinklers, smoke alarms or light fixtures. If these systems are arranged properly within the soffit, they can look as if they have been designed that way, rather than appearing as an eyesore. Even if they are not screening any mechanisms, a lower ceiling creates a cosier recreational area or a more intimate workspace. This also reduces heating bills and the acoustics in a commercial interior can also be enhanced by installing a soffit. These improved properties will remain if it is spray painted with the right coating. 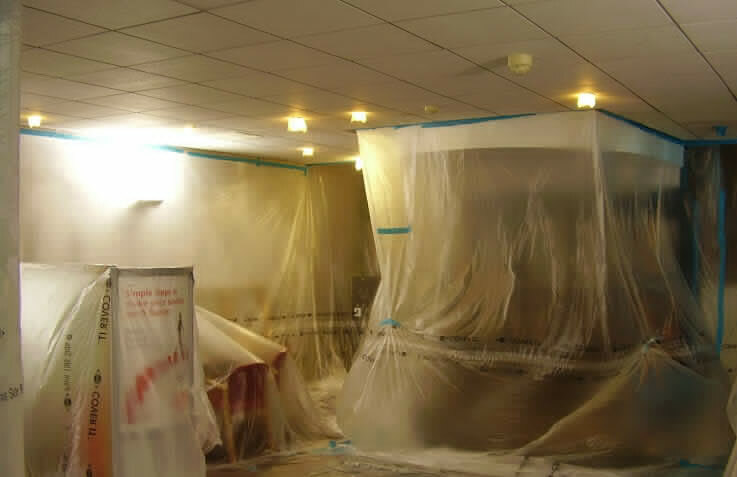 A professional onsite spraying company will be able to re-coat exterior or interior soffits as well as mineral fibre and plain metal pan or perforated metal pan ceiling tiles. The ceiling can be painted as a whole in the same colour or contrasting colours can be used on the different architectural elements for an interesting look. Experienced onsite spray painters will carry out ceiling soffit painting with minimal disruption within a live environment. Before a soffit is sprayed, the professional operatives should cover all furniture and fixtures and fittings in polythene, paper and tape to prevent them becoming damaged with overspray. Sprayers will use towers or ladders depending on the height of the soffit and it is important to ensure they are trained and qualified for this work. Either an airless or HVLP gun can be used to spray the surfaces depending on the size. Soffits can be sprayed in any RAL or BS colour no matter what they are made out of. They are usually best coated in a matt, water based paint which is the most environmentally friendly, but a higher gloss level can be used for increased sheen and reflectivity. Furthermore, light fixtures that have been integrated into the soffit can provide glowing, ambient lighting and this can be a different colour. With some thought and expertise, ceiling soffit painting can modernise the whole interior of a variety of premises.